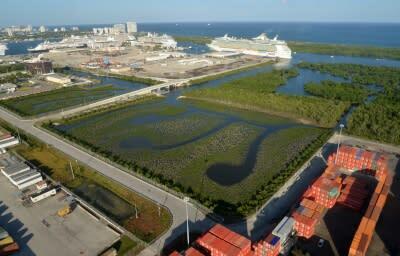 The project consists of the extension of the Southport Turning Notch to the west to create new cargo berthing area. 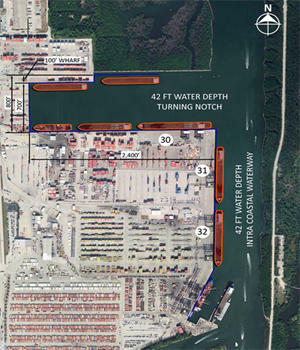 The first portion of this project included creation of approximately 16 acres of new mangroves on undeveloped Port Everglades property that was deeded to the State of Florida in exchange for an 8-acre portion of existing conservation easement needed for berth expansion. The second portion of the project includes the marine infrastructure associated with the extension of the Southport Turning Notch by approximately 1,420 feet to the west, with wharf construction, marine and utility infrastructure, and environmental mitigation. The project also consists of the landside infrastructure improvements to support the acquisition of up to six additional Super Post-Panamax gantry cranes in Southport along Berths 31 and 32 as well as Berth 30. Additionally, the project will include extending the existing 100&apos; gauge crane rails along Berth 30, westward to the limits of the new Southport Turning Notch Extension. To support the new crane rails, the project also will provide for a new two-story switchgear and office building to be located just west of the current facility. The design for the new facilities was completed summer 2016. Current Status: The Board of County Commissioners has approved a Construction Manager at Risk Construction Agreement with the Moss/Kiewet Joint Venture to construct the project. The contractor has initiated the preconstruction services phase of the agreement and construction of the crane rail portion of the project was started in March 2018. The Turning Notch Extension Project design is at 90% completion with design completion targeting June 2018 and construction commencement targeting mid-2018. Southport Turning Notch Extension Project.